In this layout, Barbara shows you how to create a gorgeous feminine layout with pink and green NRN papers. This layout was created using NRN Designs Inspiration Paper Pack, green cardstock, purple cardstock, white cardstock, brads, ink and rub-ons. Use Pink Rosebuds paper for the background. Cut two pieces from the Inspire Words paper, one measuring approximately 20cm by 16cm and the other 10cm by 16cm. Ink around the edges of both. Place the larger piece in the top left corner of the page and the smaller piece in the bottom right corner, as shown in the layout above. Cut five 2.5 cm strips of Tapestry paper and ink the edges. Position around your page as shown in the layout above. Punch flowers from purple cardstock and position one at one end of each strip as shown. Place a brad in the centre of each flower. Mat your photo with green cardstock and centre on your page. 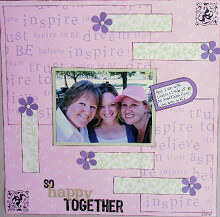 Finish of with rub-ons and a journaling tag made from white and purple cardstock.